It’s been a little over a week since Typhoon Haiyan wreaked havoc on the Philippines and as images and reports pour out of the area, one thing is clear: the devastation is overwhelming. Aid has been slow due to massive damage to the country’s infrastructure and many struggle to survive without food, water and shelter. At times like this, it’s hard to make sense of the seemingly endless loss and suffering. Though, as often is the case in these situations, through the heartbreak and horror, stories start to emerge. Stories of courage. Tales of strength. In the face of the unthinkable, instances of the human spirit overcoming. 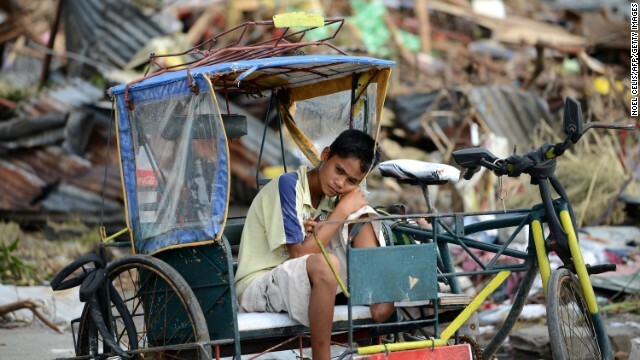 Here are six inspiring stories from the aftermath of Typhoon Haiyan. On November 11th, only two days after Haiyan wreaked havoc on the city, Emily Ortega gave birth to a baby girl in Tacloban. Emily named her baby Bea Joy after her mother, Beatriz Sagales, who was lost in the storm. Emily, who never thought she or her child would survive the storm, views the birth as “a miracle”. Baby Bea has given Emily, new-dad Jobert and all the survivors in the make-shift Tacloban hospital a much needed reason to celebrate amid the overwhelming loss. In a time when so many of our headlines are dominated by political scandals, Manuel Araneta Roxas, who holds the office of Secretary of the Philippine Department of Interior and Local Government, chooses to lead by example. Mar, as he is known locally, has stepped up in the aftermath of Haiyan and taken control of the the relief operation in one of the hardest hit areas. Mar is working tirelessly, around the clock, to coordinate donations of food, water and medical supplies to those in need. When an American reporter asked to follow Mar on a helicopter run, he said, “I can’t promise you anything. We’re filling up our aircraft with food and blankets and trying to save lives. You understand — that’s the mission.” While many politicians would jump at an opportunity for publicity and acclaim, Mar’s only interest is saving lives. It is this selflessness and dedication which has some in Manilia considering him a candidate for president in 2016. Filippino Air Force Lt. Col. Fermin Carangan was with his group preparing for emergency rescues when their building collapsed. Carangan was able to grab hold of a wooden beam, but was still swept away to sea. After floating for hours, he came across a 7-year-old named Miguel, who was clutching onto a coconut tree. Carangan was able to pull Miguel onto his beam, but the two were not out of the woods yet. While floating on the beam, they were hit with waves, winds and the unfortunate swallowing of salt water. Miguel, who had been shivering for hours, asked Carangan if he could go to sleep, but Carangan refused to let Miguel die. The two kept each other going until they eventually landed in Basey, Samar. Carangan said, “I thought, maybe I survived because of this child. Without him I could have given up.” Luckily for both Carangan and Miguel, fate brought them together. With so much destroyed, it’s hard to know where to start. That hasn’t stopped 40-year-old Dionesio de la Cruz, however. De la Cruz has already reconstructed a shelter from the remnants of his former home in Guiuan. He slowly rebuilds his life using whatever materials he can find, making a bed out of rusty nails and found materials. “We’re on our own, so we have to do this on our own. 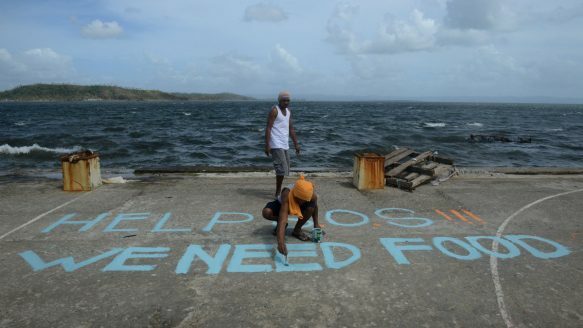 We’re not expecting anybody to come and help us,” he says. His strength is truly a testament to the power of the human spirit. Image of Emily and Bea found here. Image of Mar Roxas found here. Young Survivor image found here. Help Us image found here. Men carrying bed image found here.